The output column "" on output "" and component "XML Source" is not subsequently used in the Data Flow task. Removing this unused output column can increase Data Flow task performance. Cause: We are getting a data from a column of XML source but we are not using this. So it would be better to delete or remove that column from XML source to increase the performance. Step 1: Right click on your Component "XML Source" and click one edit option. Step 2: Click on Column tab and choose your Output from combo box. Step 3: Unchecked the columns name in list which you don't want to use and click on OK button. Note: It is necessary to select at least one column in each Output. Note: in same way we can remove the unused columns for other component. No maximum length was specified for the output column "" with external data type System.String. The SSIS Data Flow Task data type "DT_WSTR" with a length of 255 will be used. Cause: In your XSD file either generated by SSIS or created by you, doesn't specify the max length of XML tag or attribute of type string. So SSIS use default value that is 255. 1. If max length of string i.e. 255 is sufficient for you then click on OK button. Note: Change the name = "phone" attribute to your element name. The external column "" of "component "ADO NET Destination" has a data type that cannot be mapped to a Data Flow task data type. The Data Flow task data type DT_NTEXT will be used instead. The external column "Remarks" of "component "ADO NET Destination" has a data type that cannot be mapped to a Data Flow task data type. The Data Flow task data type DT_NTEXT will be used instead. Cause: SSIS doesn't support a column of data type SQL_VARIANT. 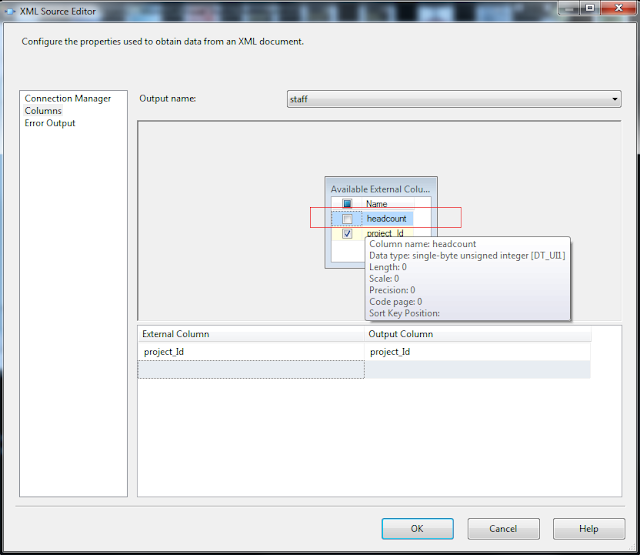 So SSIS package will type case data of Remarks column into the DT_NEXT. Since it is warning message so if you want to continue it then, click on OK button. 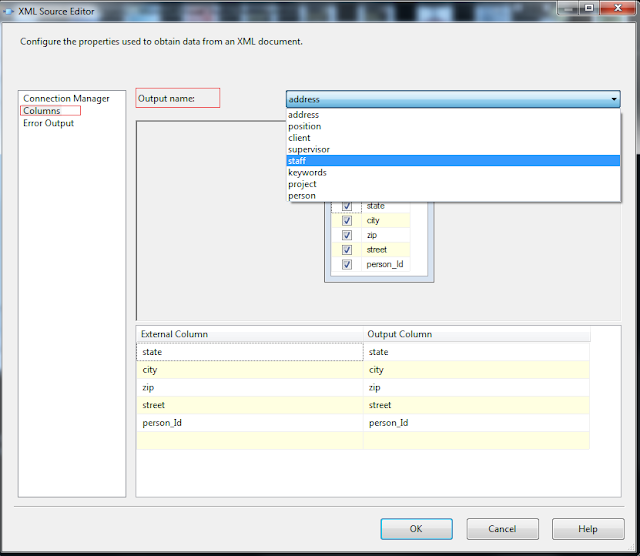 Or you can also change the data type of Remarks column like VARCHAR(MAX), NVARCHAR(MAX) etc. The references an external data type that cannot be mapped to a Data Flow task data type. The Data Flow task data type DT_WSTR will be used instead. The output "OLE DB Source Output" references an external data type that cannot be mapped to a Data Flow task data type. The Data Flow task data type DT_WSTR will be used instead. 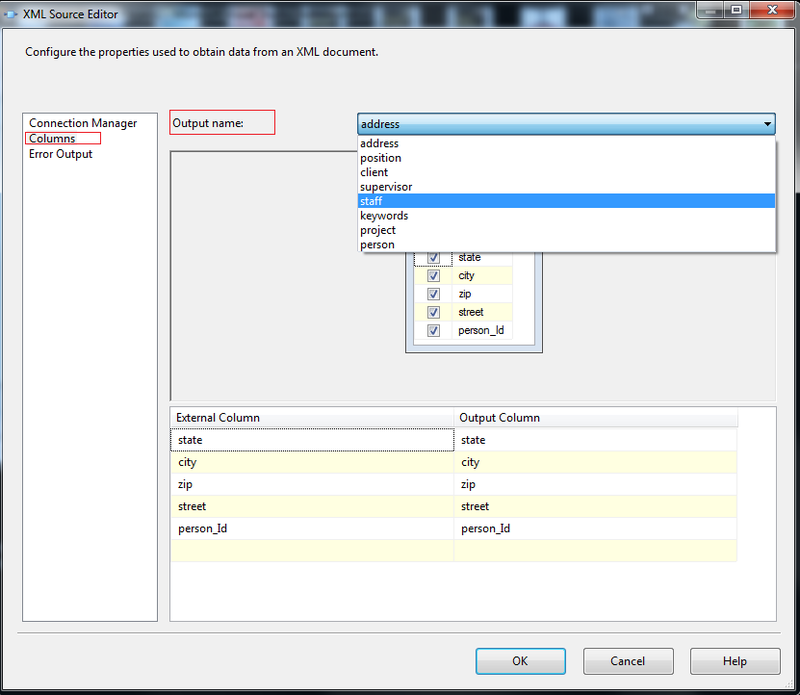 The output column "" references an external data type that cannot be mapped to a Data Flow task data type. The Data Flow task data type DT_WSTR will be used instead. The input "OLE DB Destination Input" references an external data type that cannot be mapped to a Data Flow task data type. The Data Flow task data type DT_WSTR will be used instead. There was an error setting up the mapping. DTD is prohibited in this XML document. Cause: Your XML file also contains DTD (Document Type Definition). Solution: SSIS doesn't support DTD in XML file. So remove the all DTD from your XML file. For security reasons DTD is prohibited in this XML document. To enable DTD processing set the ProhibitDtd property on XmlReaderSettings to false and pass the settings into XmlReader.Create method. 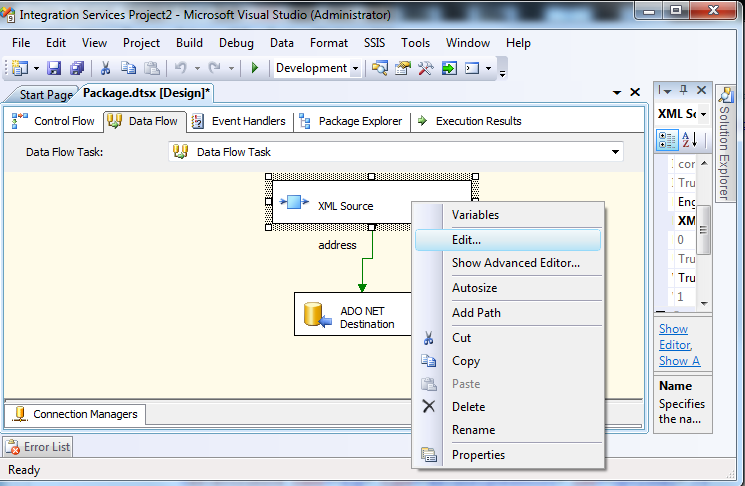 In SSIS when we will create task where data source is XML source. The data type "" found on column "" is not supported for the . This column will be converted to DT_NTEXT. 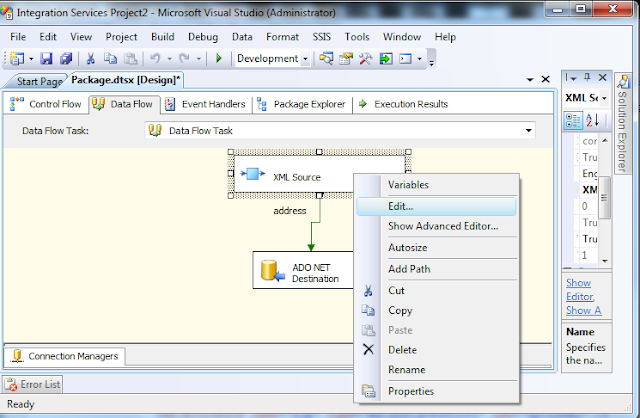 The data type "System.Object" found on column "" is not supported for the component "ADO NET Source". This column will be converted to DT_NTEXT. 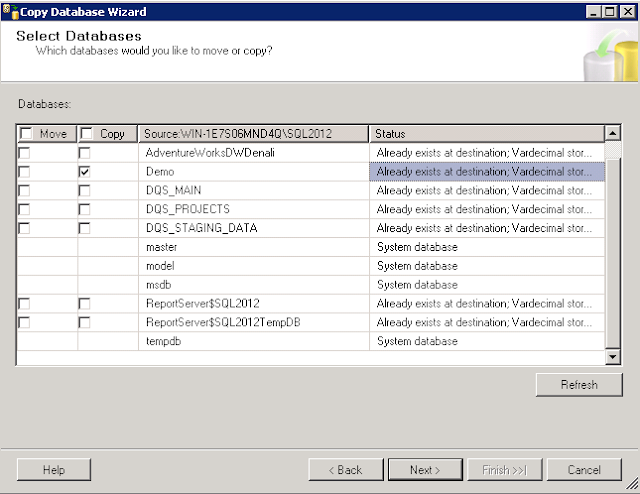 Or you can also change the data type Remarks column like VARCHAR(MAX), NVARCHAR(MAX) etc. 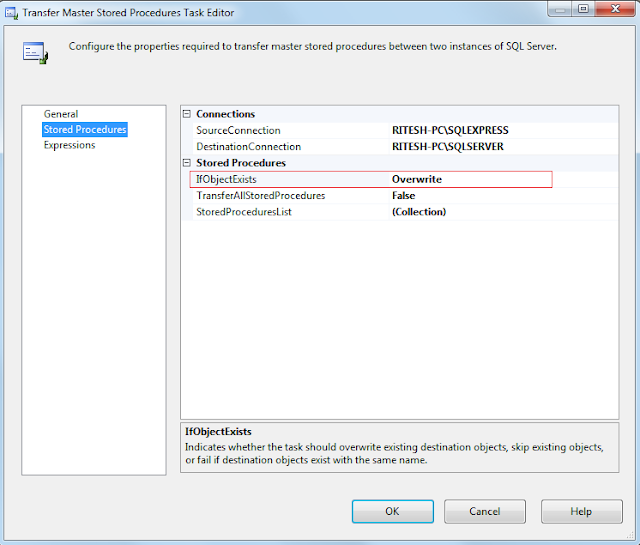 It is only warning that SSIS package is overwriting the existing stored procedure. So don't worry about this. Cannot perform alter on '' because it is an incompatible object type. RETURN statements in scalar valued functions must include an argument. 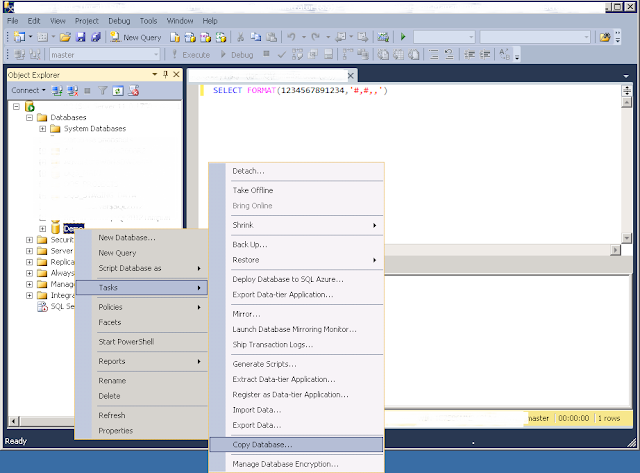 Cause: In sql server, scalar function must return a single value. So we have to pass value in RETURN statement as an argument not a result of any SELECT statement. In first function returning a result set while in second function, RETURN statement in IF clause not returning any value. Cannot use a CONTINUE statement outside the scope of a WHILE statement. 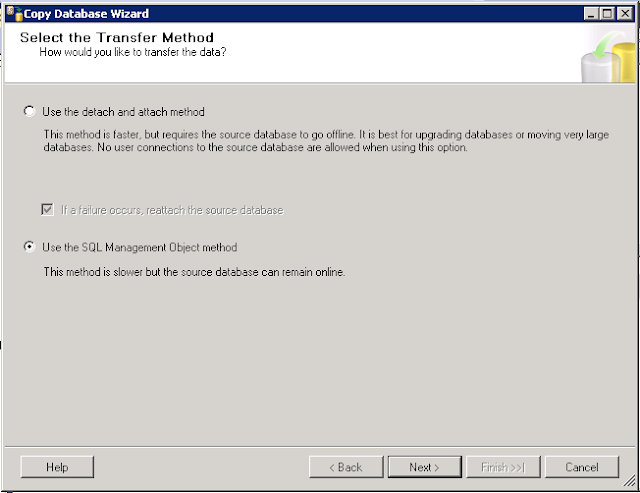 Using Sql sever management studio 2012 (SSMS 2012) we can move one or more databases from one server to another or same server. Step 2: We may get welcome window. Click on Next button. 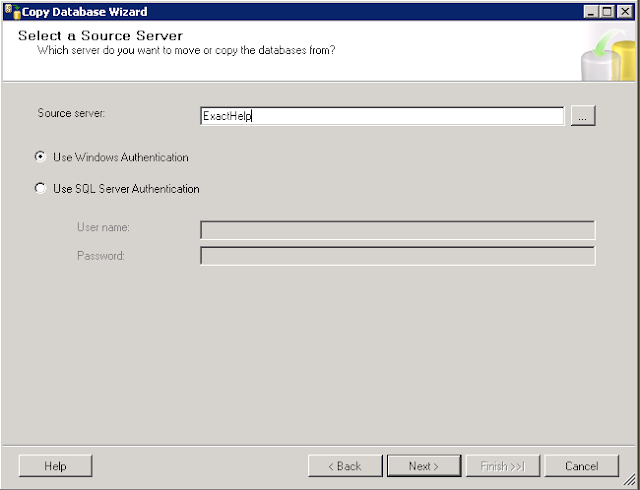 Step 3: In Select a Source Server window, choose your source database server name from where you want to move or copy databases and its authentication. Click on Next button. Step 4: In Select a Destination Server window, choose your destination database server where you want to move or copy your databases and its authentication. Click on Next button. Note: It is necessary to enable sql sever agent job at destination server. If it is not enabled you may get a pop up window to enable or run sql server agent job. Click on Yes button. Step 5: There are two transfer methods. Choose any one according to your requirement. Click on Next button. 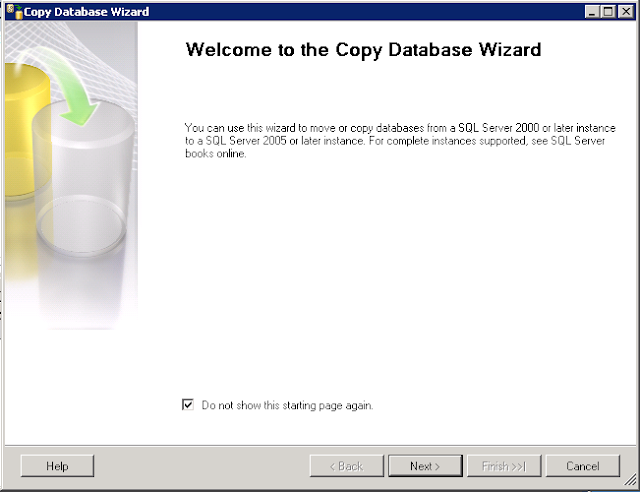 Step 6: Select databases which you want to move (delete from source sever) or copy. We cannot move or copy databases like system databases (master, tempdb, model and msdb), databases marked as replication etc. Click on Next button. 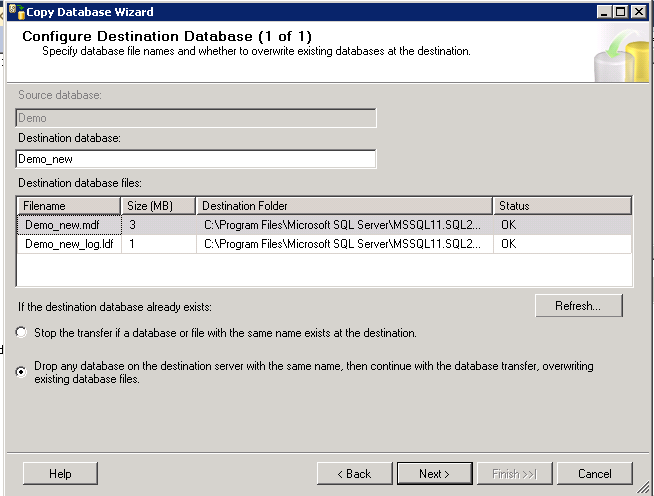 Destination database name: You can change the destination database name. Also choose the option if destination database already present at destination server. Click on Next button. 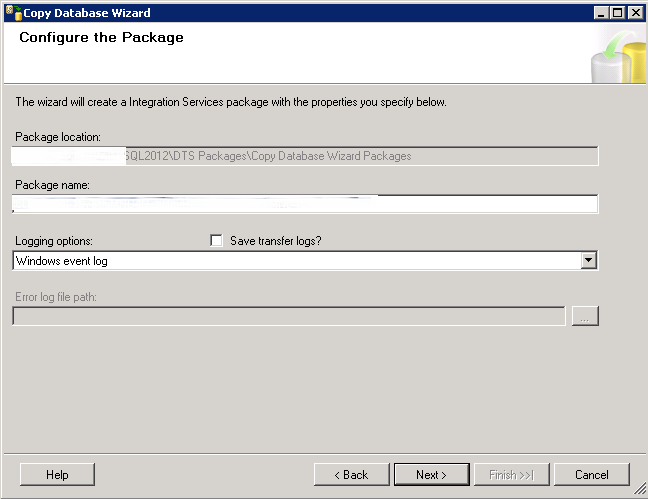 Step 8: In Configure the Package window if you want change the Package name etc. you can change here, otherwise click on Next button. Step 9: We can run only one time or schedule the copy or move database process after a regular interval. To run only one time choose Run immediately. To schedule it choose Schedule. 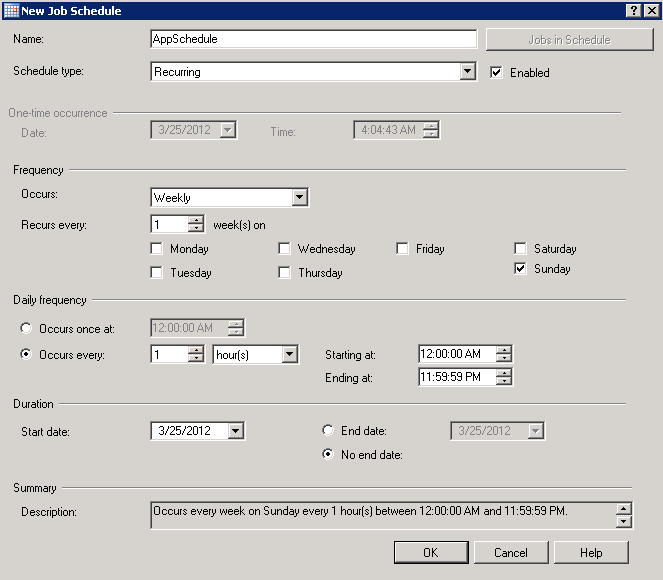 Step 10: If you will choose schedule option you will get New Job Schedule window. Fill the scheduling information and click on OK button. Step 11: In Complete wizard click on Finish button. 'DELETED' is an invalid event type. The table 'tblTarget' is ambiguous. Cause: We cannot use table which is in update clause more than one times in from clause. 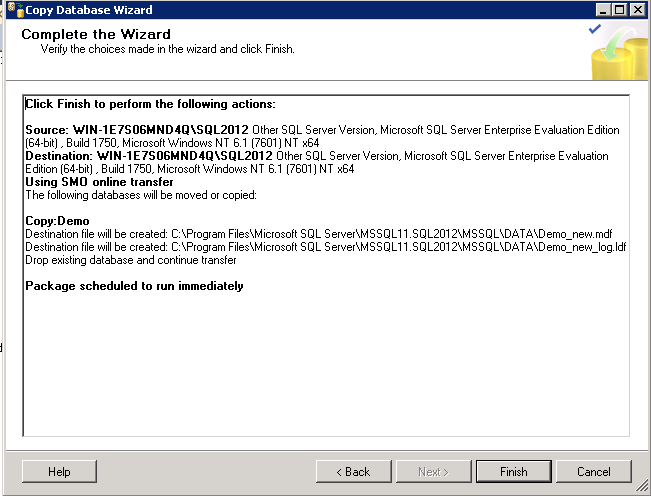 Query not allowed in Waitfor Sql server.